Respect goes both ways in a relationship. A strong woman knows her worth, and she will not tolerate being treated disrespectfully. She knows that respect is extremely important in a relationship. She will always treat you with respect, and she will expect the same in return. When one partner tries to control the whole relationship, things shift out of balance and can get ugly quickly. A strong woman is used to taking care of herself and handling things on her own, so don’t try to make decisions for her or take the reins in every aspect of the relationship. This doesn’t mean she wants total control either; there should be an equal balance between the two of you, along with excellent communication. Knowing and respecting your partner’s morals, values and personal boundaries is extremely important. 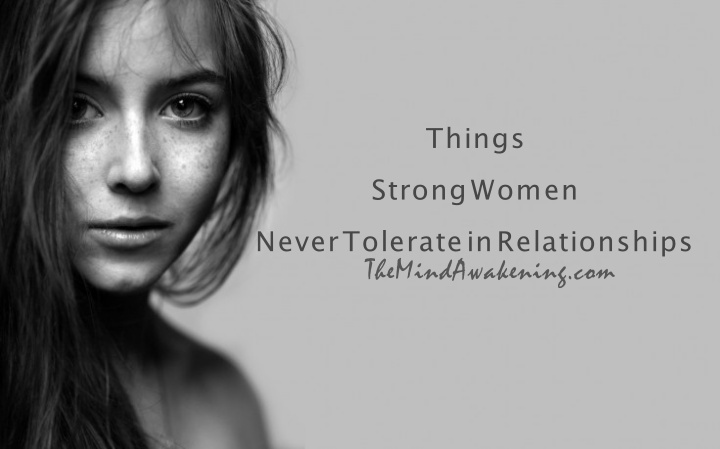 Strong women know their self-worth, and they have no problem saying “no.” She will never tolerate someone who tries to break her values or morals for selfish reasons. She will expect better from you, and if you can’t respect her boundaries, she’ll move on. Treat the woman in your relationship as your equal in every way. If she needs your help, she’ll be humble enough to ask for it. Don’t assume she can’t do something, and don’t let income, education, social status or gender play a leading role in your relationship. Everyone has a bad day every once in a while, but a strong woman knows how to push past it and get back up on her feet when she falls. Being stuck in a negative state isn’t just unattractive, it pulls down the people around you. If you are constantly negative toward your partner and her ideas, thoughts and opinions, she won’t tolerate it for long. A strong woman is most likely on a mission. She knows what she wants and she’s working to achieve it. If you put her down and criticize her when she shares her goals and dreams with you, she’ll see it as a slap in the face. If you aren’t going to support her and be by her side through her achievements, she’ll find someone else who’s willing to be standing in the front row, happy to watch her succeed.